Coll. No. 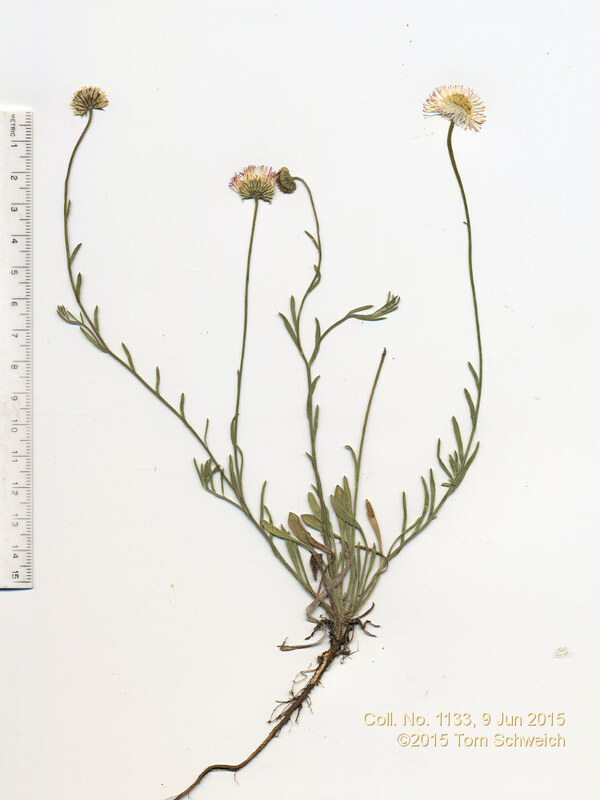 1133, 9 Jun 2015, characters observed: Perennial herb, 20 25 cm., non-rhizomatous, stems non-stoloniferous, eglandular hairy throughout, with hairs 0.2-0.4 mm. spreading in all directions; Leaves, basal and cauline, basal, petiole 23 mm. + blade oblanceolate 20 mm. × 4 mm. wide, margin entire, tip acute, some withered at flowering time, cauline, ±sessile, reduced above, but up to 32 mm. × 1.8 mm. wide; Phyllaries, in 2 ±equal series, but not distinctly imbricate, 3 mm., lanceolate, green center, light margins; Receptacle epaleate; Flowers, 2 kinds; Ray flowers, cypsela 0.5 mm. + tube 2 mm. + ligule 4 mm. = 6.5 mm. × 0.8 mm. wide, fertile, tip rounded, white fading purple; Disk flowers, yellow, just beginning to open but lobes appear to be triangular; Pappus of short and long bristles.